OH LAWD. It's here. December's pizza-of-the-month, Lazagna. 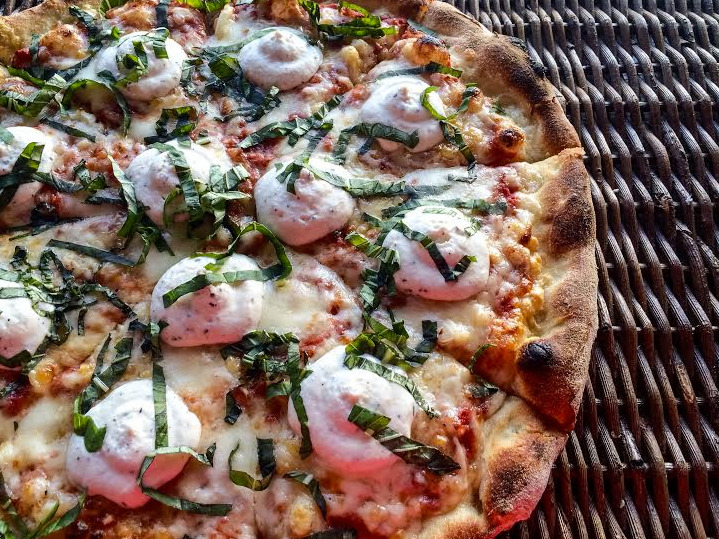 It's made with fresh mozzarella, fontina, shaved parmesan, & fresh garlic on red tomato sauce, topped with whipped, herbed ricotta & fresh basil. Yo quiero 'dis pizza. The Cinco de Hey-Oh, our earnestly loved, cross-cultural pizza prodigy is back for all of May. It's got black beans, corn, pulled chicken, diced Roma tomato, green onion, monterey jack & cheddar cheese, red onion, fresh jalapeno, & a housemade avocado-lime sauce. It'll make you say, "Sí sí sí." Order one on or before May 31st to experience a transcendent mouth fiesta. Corned beef. Sauerkraut. Horseradish cream. Swiss emmental cheese. Thousand island dressing. Caraway seeds. Fresh dill. Here 'til the end of March. Get it while you leperCAN.